I didn’t see anything dangerous about this man. “May I speak with you two?” he asked as he wobbled to a stop on his bike. He looked first to Sister Fernandes and then to me, from my black missionary nametag down to my sandals. “Yes,” I said, and he stepped off his bike onto the dirt road. I extended my hand to shake his. In my seven months of experience, a person who would approach a pair of female Mormon missionaries of his own volition was probably a teenage boy on a dare, an old drunk, a Jehovah’s Witness, or, every so often, somebody who actually wanted to learn more about our beliefs. We didn’t always know which person we were dealing with at first. I hardly noticed the way this particular man slurred his words together, because everybody in this town seemed to run their words together in a slow, backwater drawl. We were in a tiny Brazilian town called Itacoatiara (It-a-QUOTCH-ee-ah-ra), where the nearest major city was a four-hour bus ride through the Amazon rainforest. Even the locals called this place “the end of the universe.” Here, where the phones and faucets stopped working for a few hours each day, there was never much of a reason to talk fast. The man inched toward me and started to speak, making broad gesticulations in the air. I didn’t want to back away because I thought I’d offend him when the situation was probably harmless. It was still light outside, and people were bustling all around us. But when the man looked away for a second, Sister Fernandes extended her arm and forced me behind her. She narrowed her eyes at me and then turned to him. “We’ll talk to you another time when we don’t have an appointment to go to,” she told him. “Thanks.” And then she nudged me into rush-hour traffic, where the interiores — country dwellers — walked along the main dirt road, heading home after a long day of selling fish or eggs. The occasional policeman on a motorbike buzzed by us. Nice, I thought. I’m working with the pink Power Ranger. Sister Fernandes was five inches shorter and about fifteen pounds lighter than me. She was a fiery redhead from southern Brazil who had some training in jiu-jitsu, which somehow empowered her to treat me as a protectorate, someone to keep safe in Itacoatiara, a known hotbed of kite flying. We did attract a lot of attention there because of our pale skin and lighter-than-normal hair, but I was sure nothing would happen. Not there. I knew better than to frustrate Sister Fernandes by laughing, so I nodded gravely, and made fun of her in my journal that night instead. I did a lot to disappoint Sister Fernandes, or SF as I referred to her in that journal. We had first met at a conference for all the missionaries in the area. She and her missionary companion at the time, the person she had been assigned to work with, had parked themselves in different corners of the room, both crying. I was concentrating on the food from the buffet table when she approached me. “Will you go with me to speak to Presidente?” she asked. I nodded and left my plate behind. We walked into another room to speak with our mission’s president, the one who organized and counseled all the missionaries. As soon as we reached him, she began complaining about her companion and crying even more. Companion fatigue was a hazard for missionaries, since we had to work and live with the same person for as much as six months in a row. We were assigned companions; we didn’t choose them, and only under special circumstances were we able to leave their sight. Still, the mission president didn’t entertain SF’s complaint for very long. I left the conversation wondering how often she vented to him like that. She left the conversation believing that I was delicate and sweet. And from then on, unbeknownst to me, she began praying that one day we might be assigned to work together. Her prayer was answered a few months later when she and I were sent together on a long, bumpy bus ride through the jungle to a town I couldn’t pronounce. She learned quickly that I wasn’t quite what she had ordered. Just a few weeks after we started working together, she cornered me: “You look like my little sister,” she said, “and I thought you were going to be tender and vulnerable, like her.” Her brown eyes narrowed. “But you’re not like my sister,” she said. “You are dura.” She meant I was hard, stubborn, or thick skulled. Sister Fernandes loved to clean the house on our one day off in the week. All day. Everywhere. She emulated her mother, who taught her from a young age to keep a spanking clean home. I emulated my mother, too, but she was never one to scrub out the freezer on a weekly basis. I was able to come to terms with that mother of mine on my official Mother’s Day phone call, a highly anticipated treat for us missionaries, because we were allowed to call our families only twice a year. Sister Fernandes could hardly wait to speak to her mother either. We walked into the local Mormon Church building after everyone had left, and I was able to sit in a small, boxlike office by myself as I caught up with my family over the phone. I swiveled back and forth in the chair as I learned about my little brother’s latest mile time and my little sister’s eye surgery. I was really just thrilled to be in a different room from Sister Fernandes for once. Everyone seemed proud of me. There was no conflict, no tension in my stomach. After ninety minutes, I hung up the phone, satisfied. SF took my spot in the swivel chair after I hung up and called home collect, just as I had. She was the only Mormon in her family, and her mother hardly ever wrote letters or emails. From what SF said, her family strongly disapproved of her mission, but still I thought they’d be happy to connect with her. She admired her mother so much. I sat on the floor outside the office to read while she began her phone conversation. From there, I could hear Sister Fernandes’ muffled Portuguese, the pitch of her voice rising higher and higher. Her voice started to quaver. After less than twenty minutes, she hung up and turned the light off in the office. I followed her out of the church building, dying to know what had happened during her phone call. What could have gone wrong? Had she told her mother what a bad companion I was? When we opened the door to our house, she collapsed on the floor and wept. “I wanted to know if you really cared about me. That’s why I tested you,” she said. I couldn’t believe this. What was going on? Was this a normal missionary thing in the Amazon? Like Survivor? I was suddenly curious to know how I scored. “Sister Babbel, you failed. It’s clear that you don’t really care about me.” I didn’t know what to say. I was afraid she was right. About a week later, as we walked out of the house for our morning appointments, Sister Fernandes told me about a dream she’d had: “We were walking outside and a man came up to us. He wanted to kill you, but you had no idea. You were acting really ditzy, so it was up to me to save you.” We both laughed. Even in her dreams, she was trying to protect me from bad guys. It was nice to forget the way we had treated each other before and feel like friends, at least for a minute. My voice grew hoarse that day because of a cold. I seemed to get them all the time, even in the summer, from shaking too many hands. By sunset, Sister Fernandes was doing all the talking herself, because when I opened my mouth, nothing came out. She probably loved that. We visited a family who wanted to learn more about our faith that evening, and I tried to stay engaged, even though I couldn’t do much more than nod and smile. When the visit was over, we walked away on a dirt road, with a thick wall of forest on the left side and a few crossroads on the right. At half past eight, it was too dark to see the strings of green and gold decorations that appeared here and there along the road in celebration of the ongoing World Cup. They were nothing but jagged outlines. As usual, no buses, trains, or planes made any distant noise. The lights from the high school fell far us behind as we walked, and our road grew darker. We made our way down the deserted road for a minute or two, and then we heard someone on a bicycle come up from behind us. He passed us and then circled around to a stop. “Can I talk to you?” he asked us. SF hardly looked up before she said yes. He stepped off his bike and asked her to hold it for him. SF let him place the handlebars in her palms and looked away for a second, as if she were bored. Another weird street conversation, she was probably thinking. Where did these people come from? The man, now free from his bike, started to inch toward me. It had been too dark to see him clearly when he first approached us, but as he drew nearer I could see something wrapped around his face — something that looked like a black t-shirt. The only features I could make out were his two bloodshot eyes, illuminated by the distant lights of the high school. He came closer and closer toward me, his eyes never leaving mine. I didn’t extend my hand for a handshake, as I usually did. I stepped back as he stepped toward me. Something was wrong. Something was off. I tried to think of how to get out of the situation. Without saying a word, the man pulled something shiny out of his pocket in a slow, stealthy motion. Even though my voice had been gone all day, I screamed — I screamed so loud that I hardly knew it was my voice. He said nothing but he faced me, holding the knife in his right hand and pushing it closer and closer until it was nearly touching the fabric of my dress. I felt as if I were watching a movie. I couldn’t move. Without a word, Sister Fernandes shoved the bike toward our attacker. She grabbed my hand, and suddenly my legs moved again. We turned and ran away from him. When I finally had the courage to look back, I saw him in the exact same spot, watching us run. We ran left onto a street with a few well-lit homes and pounded on a door, both of us shaking. I didn’t even stop to think that two Mormon missionaries banging on a door in the dark could be a counterproductive way to find help. But a kindly middle-aged couple let us into their home. They allowed us to recover from the shock, use their phone, and they even made some herbal tea for us. We were able to wait there, at turns calm, at turns, crying, while we waited for a man from our church to walk us back to our home. We couldn’t identify our attacker at the police station the next day, but I can still picture his silhouette on the street, a t-shirt covering most of his face and his hands gripping the bike. Sister Fernandes and I were promptly transferred out of the area, which was deemed too dangerous for female missionaries. We were reassigned to an area in probably the safest place in all of Brazil, a suburb straight out of “Leave It to Beaver,” with paved streets, fenced yards, and lots of streetlights. We worked there for two months and then we were sent to different areas and companions. Sister Fernandes left for home shortly afterwards, having completed her eighteen months of missionary service, and I didn’t expect to ever see her again. 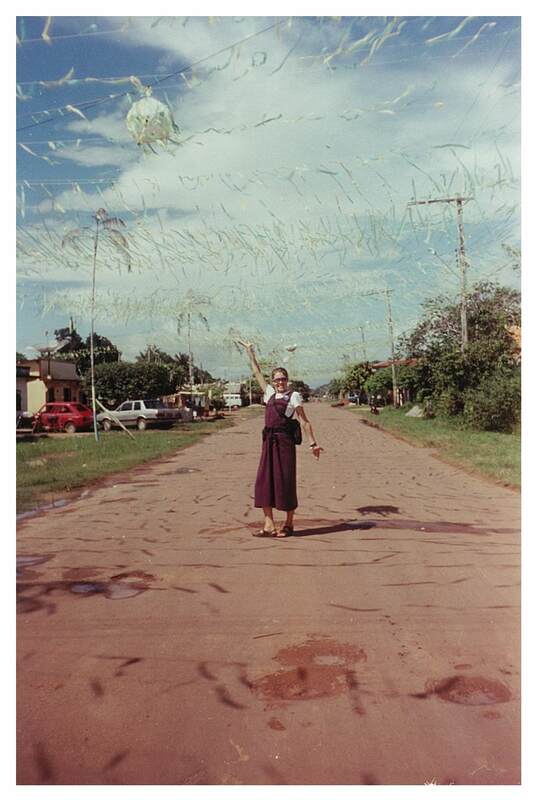 Nearly two years later, I had gone home, graduated from college, married, and returned to Brazil with my husband. We had both found jobs that allowed us to work in São Paulo — a move that would allow me to use my Portuguese. While we were there, we decided one evening to visit the Mormon temple in the western part of the city. We were sitting on a bench in the chapel in the middle of the temple, whispering to each other, when I noticed a familiar redhead sitting behind me. I don’t know whose jaw dropped lower, hers or mine. We embraced. A group from Sister Fernandes’ congregation had travelled hundreds of miles to Sao Paulo, and she would be there all weekend. We could hardly keep our voices to whispers, as we were supposed to do in the temple. We made plans to do things that we could never do on our mission — mall cruising and lunch at a restaurant. The next day, I picked up Sister Fernandes in our car and we drove down Avenida Faria Lima toward the swanky mall. She had married, too, and we chatted about her husband and family. She seemed serene in a way that she hadn’t been on the mission. It seemed so natural that she was sitting in the passenger seat and talking to me like a real friend. For the very first time, I was able to see clearly what she had done for me. I owed my life to her. She was the one person on my eighteen-month mission who wasn’t afraid to tell me I needed work, the only one who could name all my weaknesses and faults but who still wanted to protect me — a little bit like a sister. “Are you trying to kill us?” she cried as I cut in front of the car in the other lane. It was a little trick I had learned while driving in São Paulo. “In the United States, don’t they make you take a driving test before you get your license?” she asked. Elise (Babbel) Hahl is a recent graduate of the Johns Hopkins M.A. in Writing Program. She has recorded work on The World in Words podcast and contributed to Choosing Motherhood, a compilation of essays that will be published into a book in March of 2013. She lives in Belmont, Massachusetts with her husband and three sons.